Happiness is a broad, diverse topic ... and happiness is different for everyone. Not only that, everyone wants to be happy. It's just human nature. So, it probably comes as no surprise that there are thousands of articles written every year on the subject. 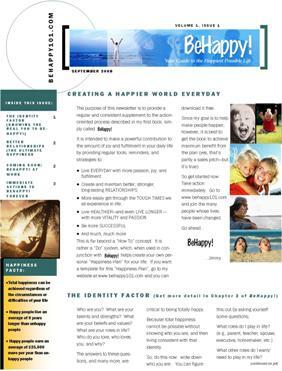 This page is a comprehensive resource for you to find information and advice from various magazines, journals, websites, and other media (in addition to right here at BeHappy101.com) on just about anything you need to fulfill your own personal Definition of Happiness. 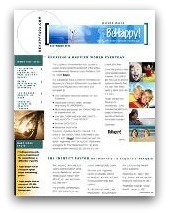 So, below - on the left side of the page - is a list of some of the most popular original articles (by me) here at BeHappy101.com. On the right side of the page is a list of articles which have appeared on other websites, in magazines, and in newspapers throughout the world over the past couple of years. These are updated regularly, so check back whenever you want to read one of the latest articles on the topic of happiness. I'm Just Not "In The Mood"
Can Happiness Improve Heart Health? Is Happiness at Work Essential? How Are Happiness and Sadness Like Diseases?